Jim Ervin will look around the Seaview changing room on Saturday leading up to kick-off in the knowledge he stands alone in terms of medals and big-game memories. Around a decade in Linfield blue will provide most players with an enviable collection of Irish League moments. However, the 31-year-old has his focus very much on the future and remains excited at the potential for progress. 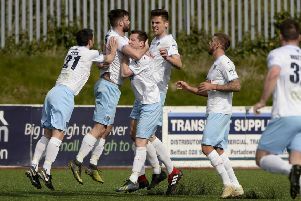 Victory on Saturday would wipe out the pain of the 2015 showpiece defeat to Cliftonville and secure a first League Cup final prize in Ballymena history. If the final whistle signals the start of the Sky Blues’ celebrations, Ervin could be forgiven for feeling it marks only the next step forward for a club very much on the rise following David Jeffrey’s appointment last year as boss. “I always knew coming here that there would be a possibility and I believed that there would be plenty of chances to win silverware,” said Ervin, who marked his first Linfield trophy as the League Cup. “There’s been an Irish Cup final, this will be the second League Cup final and a County Antrim Shield final. That proves that, when I said I believed we could challenge, it has been the case. “Since David’s come in, there’s been a big change at the club, not just on the playing side but behind the scenes that people wouldn’t see or realise. “Overall, 11 or 12 players left at the end of last season, new players came in and David has built on that again in January. “The 13 or so years I’ve been involved in Irish League football, this has probably been the most gruelling and hardest pre-season I’ve ever done. “David always said it would stand us in good stead come the last 10 minutes of games or come the last two or three months of the season. “We seem to have reaped the rewards when we have finished games strongly. “The belief we have in the squad is second-to-none, when the chips have been down, we’ve pulled ourselves out of a hole. Ervin’s career has been punctuated with the highs and lows a cup final day can provide - and presented a measured approach thanks to those experiences. “The cup finals that I’ve been involved in at Ballymena, we’ve gone into as underdogs but last season we beat Linfield in their own backyard in a cup final,” said Ervin. “Anything can happen in cup games. “We’ll be prepared and focused and we won’t be looking at anything in terms of who are the favourites or not. “When you look at the support we’ve had this year, attendances are up at the Showgrounds, we’ve had massive crowds of late. “We’ve been saying for years that we need to do more to get folk out to games. “This year we’ve noticed a big difference and that’s through the football that we’re playing and the results that we’re getting. Kick-off will be at 5.30pm.